The Breakfast Gift Basket for two has everything they need for the perfect beginning of any morning. 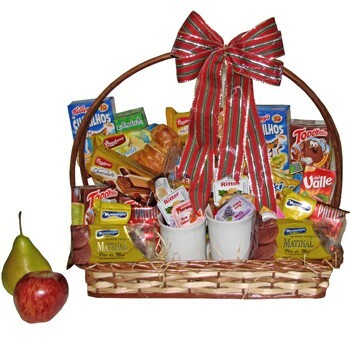 Filled with delicious breakfast treats this gift basket should not be rushed through it. IMPORTANT: Breakfast baskets are delivered in the morning, between 7:00 a.m. and 10:00 am; therefore, there is no need to select AM delivery - simply select 08:00 to 7pm delivery time. There is the option of choosing a specific time, upon payment of an additional fee. If you wish for a breakfast basket to be delivered as an afternoon tea gift basket instead, kindly specify this in the order form by filling out the *Additional information* field. The basket will then be delivered between 3 and 5:30 pm. No additional fees. - The Coffee and tea are delivered in individual sachets.